It is a good day for soup. On Wednesday, I posted a picture of black bean soup, and said that I would give directions for bean soup later. Like the Lentil Soup this is really a Foundation Recipe, a template, if you will, that you can vary almost infinitely. I’m going to give directions and show you what I made this morning, and even write up a recipe for you – but I may never make this exact soup again, just because I’ll have a different assortment of ingredients on hand. 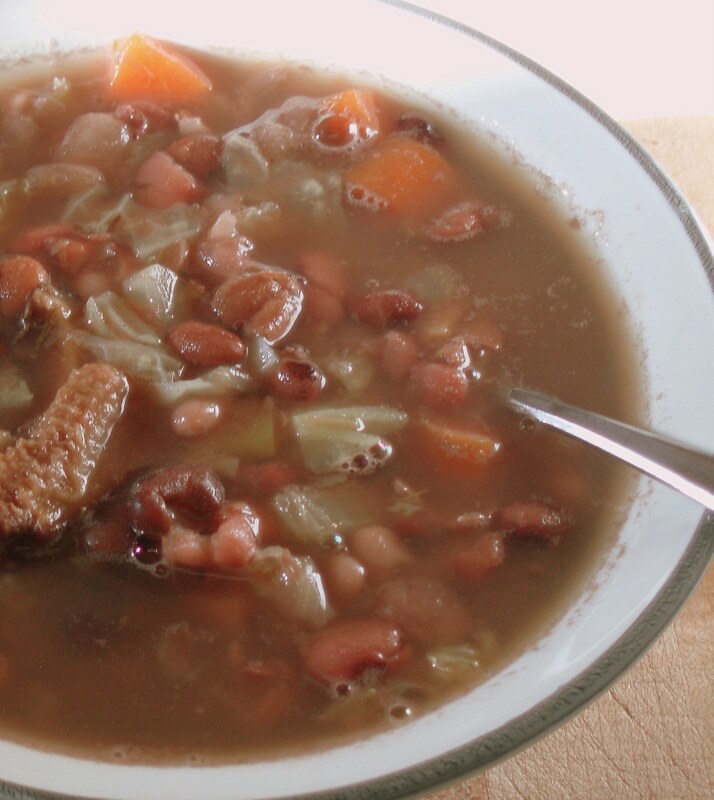 First – it’s a Many Bean Soup. We eat beans a lot, and we tend to buy in bulk. Even if I buy a pound of beans in a package, I may have half a cup or so left when I make a recipe. I used to keep these dribs and drabs around in their bags taking up room, and combine them in a pot every so often – but lately I’ve taken to tossing them all in a glass canister and mixing them – aside from anything else, the mix is pretty. 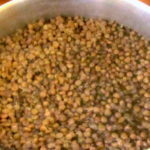 I have not, this time, added lentils or split peas, which cook faster. 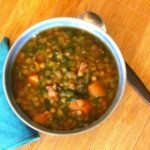 If you want to, a mix of mostly regular beans with a few quick cooking ones is fine – the lentils just cook to mush and give it texture – but a lot of lentils with just a few kidney beans doesn’t work as well – you tend to get a few undercooked beans in an otherwise good soup. So – these are 2 cups of mixed beans. 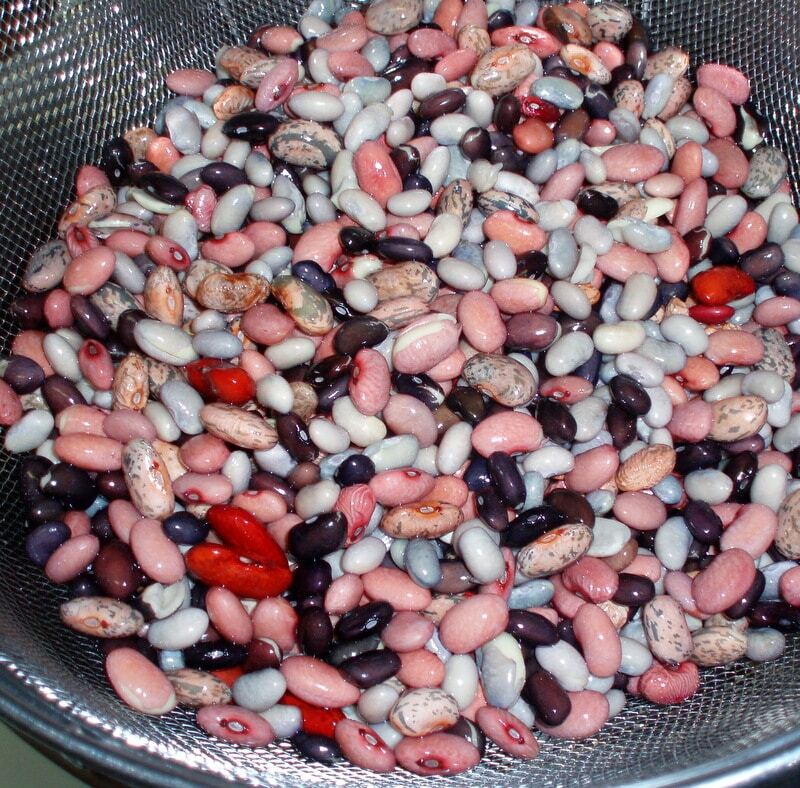 Kidney, black, navy, and pinto beans, basically… could easily have white pea beans, azuki, red, whatever beans you like and use. And you can absolutely use just one kind of bean in this soup – 2 cups are roughly a pound. Just get a bag of beans, whatever kind you like, use the whole thing, you’re good. Last night, I washed them carefully and picked over them. Always do that – the last time I got navy beans I did have a small pebble in them (which can really spoil your day, not to mention your soup) and a little dust or dried mud is not unusual. Anyhow… in the morning – I had soaked beans. I wanted to eat the soup for lunch, so, when I came out to start my breakfast, I first drained and rinsed the beans, returned them to the pot with 2 quarts of water, covered the pot, brought them to a boil, and let them simmer. Be careful bringing beans to a boil – they tend to foam up,and can boil over easily. I was still in the kitchen, so removed the lid when I started to hear the boiling – and just caught it. I often tip the lid slightly, then, to allow steam to escape and prevent boil over. Some pots now have tiny holes to allow steam to escape, which should also help (I’ve never cooked with one, myself.) And I simmered the beans for 2 hours. This stage could have been shorter – I was just doing my usual morning routine, so didn’t move on until the next step until I was ready – and the beans were, too. At this point, I wanted to add other ingredients for flavor. Some sort of aromatics, always. If I had been thinking, yesterday, I would have remembered that I had finished the onions, and gotten a couple. I was not, however, going out in the cold snow for an onion… and I do have sauteed leeks in the freezer! So that was fine – a chunk of leeks… I also still have some celery (though I could have used frozen celery, too) and a carrot, so I washed and chopped them, and added them. I wanted a bit of flavoring for the broth. I can get inexpensive dried Shiitake mushrooms – try a local Asian store, though in fact, I got these at Costco… Usually, they come whole, and I’d have used 4 or 5, and broken them up a bit. These were sliced. The great thing about dried mushrooms is that they basically give you mushroom broth. 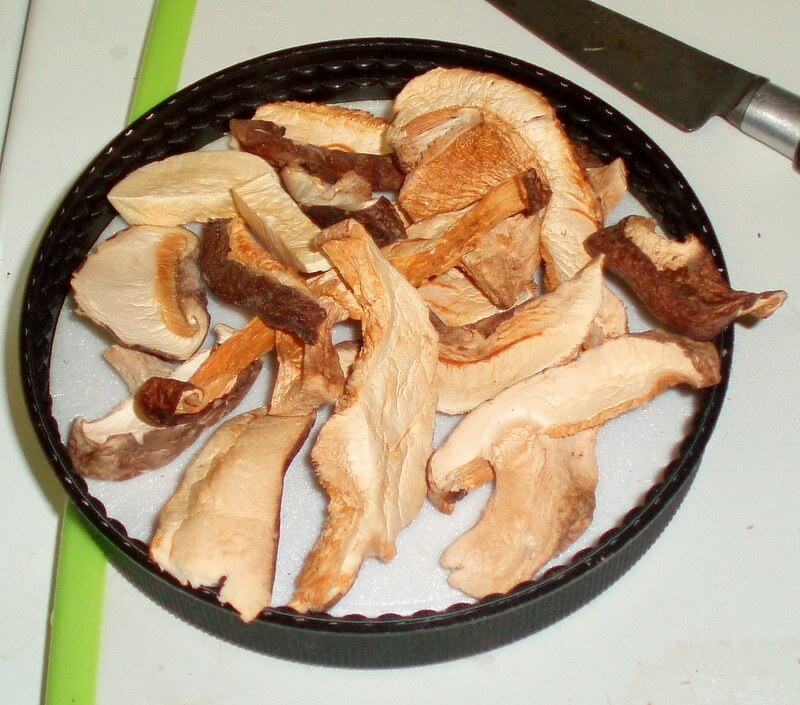 If you don’t have, or want, mushrooms, you can just use the plain water – but, especially if you omit the meat, your soup will have more flavor if you use some kind of broth, instead of the last quart of water. Or you can use some soup base, or Better than Bouillon, or something like that. (You can also use a plain bouillon cube, but they tend to be all salt and MSG – I prefer the variety that actually have some of the meat or vegetable in them.) I also added a teaspoon of salt – if you’re using a salted broth or broth base, you may want to use less, or even omit it. I could also, at this point, have added seasonings. I didn’t, and it is still good – but bay leaf would be classic. I’d used savory and oregano in the black beans the other day – sage and thyme are traditional with white beans, cumin and oregano and perhaps some hot pepper with pintos, anything that sounds good to you. I simmered this for another hour. 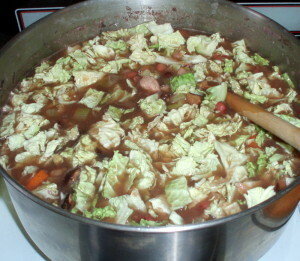 I wanted some more vegetables, and I had a cabbage, so I chopped some of it – about a packed cup of chopped cabbage all together. Simmered it for another 20 minutes, and it was done. Now – this is a recipe for a soup made on a day when I’m at home, wandering in and out of the kitchen. 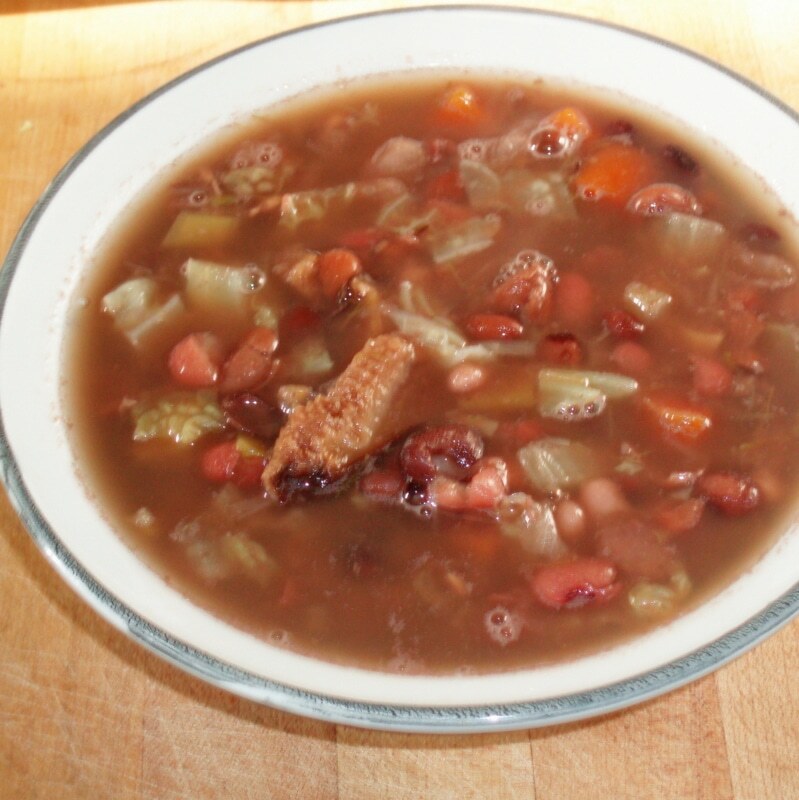 If I were busy with something that could not be interrupted, I could start with the soaked beans and throw everything in the pot – the soup would still be good, though the meat and vegetables might be a bit overcooked to my taste. If I were using a slow cooker, I might do that in the morning, and set it all to cook on high for six hours. (Most beans can be cooked on Low for 8 hours – but some need the higher heat to cook well.) 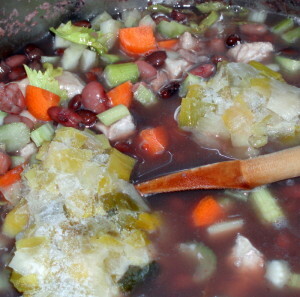 Or I might cook the beans overnight, then add the meat and vegetables to cook during the day. Or, I could just start with canned beans, at the point where I added the meat and aromatics. This is an incredibly flexible recipe. What are your favorite combinations for bean soup? 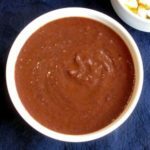 Do you go for the classics, like Senate Bean Soup or Brazilian Black Bean Soup, or do you like to experiment? Please share. The more suggestions listed, the more good soups we’ll all make! Wash beans, pick them over well. Soak overnight (8 hours or more) in cold water to cover. 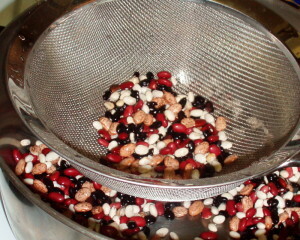 Drain and rinse beans. Place in a pot with 2 quarts water, Bring to a boil, simmer 1 1/2 - 2 hours. Add celery, leeks (or onion) and carrot. Cut meat, if using, into small bite sized pieces, add to pot. Add dried mushrooms, if using, and salt Add another quart of water or stock. Simmer another hour, or until beans are completely soft. Add chopped cabbage. Simmer 20 minutes. Looks so pretty and delicious. Thanks for joining in with #recipeoftheweek - I've pinned and tweeted this recipe :) There's a fresh linky live at the moment, so do please pop over if you haven't already!